HOW TO INCREASE FACEBOOK FANPAGE NATURALLY? Growing a fan page on Facebook requires a lot of effort and time. With my own personal experience, it took me months to have a decent amount of followers. If you also have one and want to grow your audience and increase its user engagement, I’ll show you how I made viral content to grow my page naturally. Here’s a great method to effectively expand your Facebook pages likes in few simple steps. In today’s trend, a Facebook post in which people can relate themselves has more chance to gain more likes than a just a regular post. A combination of comedy and wittiness has more possibilities to become viral. Well, its true that creating a photo meme is good to produce a viral content. But sometimes, people prefer to watch, like and share videos that they enjoyed watching on their newsfeed. This gave me an idea that, ( how about incorporating a meme into an already good video content?) want to learn how? continue reading. HOW TO CREATE A VIRAL VIDEO MEME? 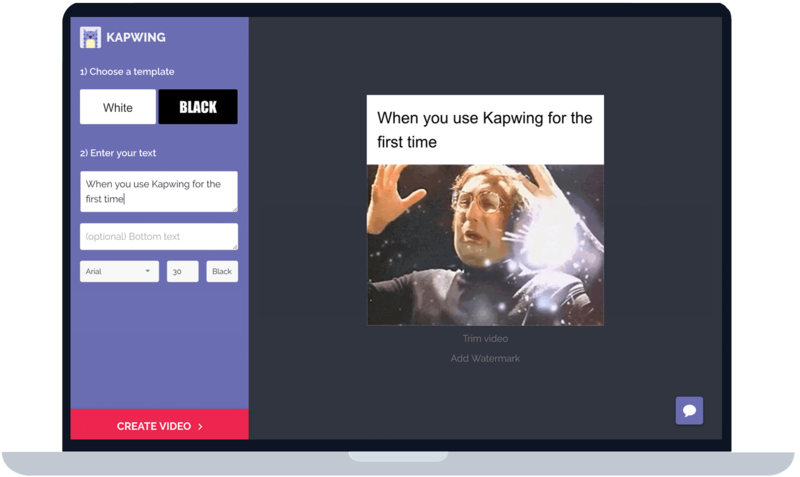 kapwing.com is an online video editor offering different types of tools to edit a video. You can do alot of stuff like trim, combine, collage, add filters, resize, and a lot more into this amazing website. Amongst these options, my favorite is the online video meme maker. In the past, I created my own video content using a software on my computer and it is taking a lot of my time. Today, this online video editor helps me save time and effort. This tool helps me grow my fans by creating a content. Here’s a screenshot of my views ever since I started producing daily content on to my facebook fanpage. If you want to learn how I made these numbers, below are the steps on how I did it. #1 Scrape videos on Youtube related to your niche. Example: Search for the term like “cute cats” and filter the results with “creative commons” to avoid copyright infringement. #2 Copy the video URL of your selected clip and paste it into the kapwing video editor. Take note that you can also upload your own video. #3 After uploading or pasting the URL into the box. You can now start creating your own MEME description. You can write anything you want, make sure it’s short, witty and appealing to the audience. Think of something your fans would like to see. #5 Download the video for FREE! ” Tag someone who love cats, or Tag a friend who would love this! ” so people would engage more to your content. aaaaaaand your done! easy right? with 6 simple steps, this will help you grow your facebook page naturally with real organic likes and followers. Remember that you still need to do an effort to make your video viral. One of the trick is to share your created content into big Facebook “groups” which is related to your niche. An example is you can search and join for groups with more than 1000+ members. Join FB groups related to “your video niche” to share your video content. Having the same niche to share your video meme has more chances to gain natural likes and share. Take note that you could always download the meme video for free, but it will show a simple watermark of “kapwing.com” on the bottom right side of the video. If you prefer to have a video with your own watermark, or without the “kapwing.com” at the bottom right end of the video, you can subscribe unlimited watermark-free videos for $20 a month. That’s it! this is one great way to produce a content that would help grow your fanpage. If you like this content tutorial or have more tips and tricks on how to produce likes on your facebook page for free naturally, put it into the comment section below.